Because the security of your employees is a priority, offer a safer work environment while saving time and money! From conception to manufacturing, our safety net protection systems gives you peace of mind regarding machine protection as recommended by the CNESST and other safety codes. A unique and simplified innovating mechanism. Basic systems starting at 42in. Heat sealed contour to prevent water and dirt infiltration in the folds of the fabric. Easy installation with a detailed plan. Much lighter than a traditional metallic protection system. Compatible with emergency pull cords. Quick access to the equipment by simply sliding the net to the side. 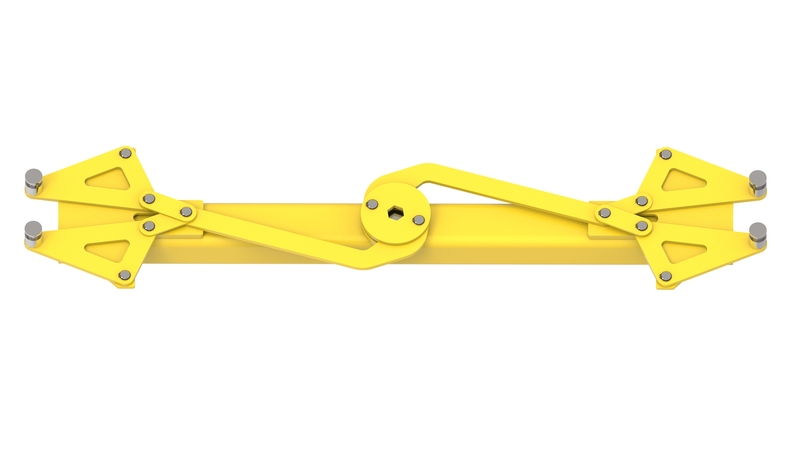 When you choose our safety net protection systems, you can count on a unique and simplified innovating opening mechanism that can be opened with a simple hex key. A single gesture allows you to have a direct and quick access to secured areas. Trust our dynamic team to take in charge your project. Our unique heat sealing process that replaces traditional seams for the outline of our safety net protection systems greatly increases its resistance to the elements, preventing infiltrations. You can totally trust our unique and simplified innovating opening mechanism. With a single gesture, using a hex key, you will have a direct access to secured areas, greatly reducing the risk of injuries and the loss of time a traditional metallic system would offer. Every parts of the mechanism are covered with a 100% solid electrostatically applied powder coating to ensure quality and durability of our products. You can count on our safety net protection systems to offer a safer work environment to your employees while saving time and money. Plus, you will gain a quick access for an easier maintenance in the protected areas. A unique and simplified innovating opening mechanism. Easier maintenance in the protected areas. Transparent net that allows you to see the equipment at any time. Heat sealed contour to prevent infiltrations. A unique and simplified innovating opening mechanism using only a hex key.